This excerpt from my dissertation is the conversion-story summary of Respondent Ten, a male from East Jerusalem. Feel free to interact in the comments or download my dissertation as a free PDF! Dunning, CA (2014) Palestinian Muslims converting to Christianity: effective evangelistic methods in the West Bank. Pretoria, South Africa: University of Pretoria, PhD thesis, pp. 335-337. Respondent Ten was raised in a moderately religious home that self-identified as Muslim, but did not live “like good Muslims.” However, the respondent was “always uncomfortable with Islam.” He said, “I always wanted to pray, but not in the Muslim way.” Though he was not a very observant Muslim, he knew enough about Islam to have certain objections. Specifically, he was troubled by what he thought was the cruelty of Sharia. He also was quite perplexed why millions of people would venerate at the Kaaba in Mecca, which he said, “is just a stone.” Any time he tried to raise these objections to his parents, he was told, “Don’t ask questions!” This type of response to his questions only served to push him further from Islam. The respondent awoke from his dream confused, but with a good feeling about what had happened. However, he did not tell anyone about the dream, neither did he begin reading the Bible. After about two years, the respondent had his second dream, which was the first in a series of three. About one month later, he had the same dream in which he was sitting inside a church reading the Bible. In conjunction with these dreams he met a few evangelical, Arab Christians who were very friendly toward him. After the third dream in this series, which occurred about one month after the second, he asked to meet with the Arab Christians he had recently met. During their conversation, the respondent mentioned his dreams and that he thought it was odd for a Muslim to have a dream about Jesus. He was surprised when one of the Christians said, “You’re not the first Muslim to have a dream and you will not be the last.” He was also surprised when the man told him that “Muslims are getting a message” because he had not heard of others having dreams like he had. This prompted him to ask for a Bible, which he received the next day. He immediately began reading the New Testament secretly, and in three months, he had read it five times. As a result of repeatedly reading the New Testament, he described himself as falling in love with Jesus. He said, “I loved what He taught. I loved Him. And I wanted to know more about Him, so I asked if I could attend a [Christian] meeting.” A few days later, the respondent went to a Christian concert, which was followed by a meeting. During the concert, one particular song repeated the words “God is with you” several times, which the respondent understood to be a message similar to the dreams he had experienced three to five months prior. After the concert, he attempted to hide in the meeting by blending in and not speaking to anyone. However, many people greeted him warmly, which surprised him because he hadn’t expected that. In describing the meeting, he said, “I was touched by the message, and at some point I realized it was okay to relax and even thought it would be nice to return again.” Between meetings, he continued to secretly read his Bible at home, which he thought gave him more confidence because the next week he made no effort to hide and sat in the front. After two months the men who had been so patient with his questions finally said, “There’s nothing more we can do or say to prove to you that Jesus is Lord. You need to pray and ask God to show you.” This bold approach calmed the respondent, and after returning home, he began to pray as they had suggested. Themes that emerged in this interview: Personal Bible reading, being “drawn/compelled,” Q and A, doubts about Islam/Qur’an, the kindness of Christians, prayer, dreams, retreats/conferences/special events, meeting Christians/MBBs, the “prayer of salvation,” the Qur’an as a bridge, and common objections to the gospel. The guys in the photo below are refugees from Sudan. 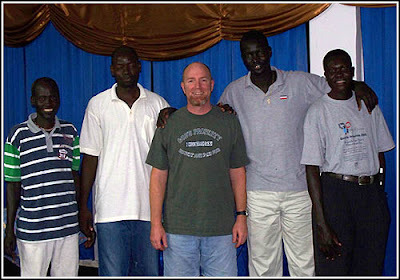 They are becoming the leaders of the Sudanese Church in Tel Aviv, and our church has adopted them. Besides some financial help, we are trying to train them to be leaders of the church. We recently finished a Bible study methods course, and are now beginning to study the qualifications of a church leader found in I Timothy 3 and Titus 1. The studies are interesting in that we use English as the teaching language, but Arabic and Dinka are used as well. Hopefully, my Arabic studies will help me be a better teacher for them.